Newest Model: 2019 SINGTRONIC KA-550DSP's hottest product from Singtronic, the world's first digital karaoke console mixing amplifier with a built-in 500W + 500W of hard hitting power. Equipped with a BBE & DSP Ultra High Processor, music & vocals come out with rich details heard in concerts. The newest features added is the Digital Sound Processor which allows you to professionally fine tune your speakers. Bluetooth Function which allow you to listen music wireless from any phone. HDMI Function also built in KA-550DSP with High Definition output on both Video & Audio, which produces the highest and best sound quality. Also built with rich professional console appearance. The Singtronic KA-550DSP also includes a USB slot reader allowing you to plug your MP3 player. The Singtronic Professional Rack-mountable KA-550DSP Professional 1000-Watt Console Mixing Amplifier is designed with KJs and serious karaoke singers in mind. 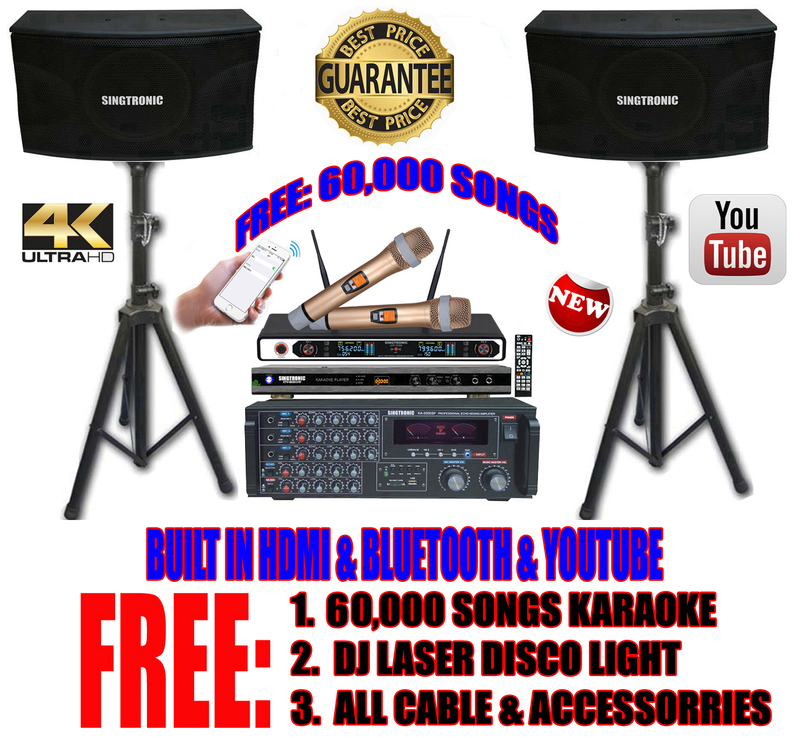 It's patented design will forever change how you will be using your karaoke mixing amplifiers in the future. Newest 2019's Bluetooth Function. Forgot your USB flash drive at home? Want to play audio files from your phone while keeping it safe in your pocket? No problem. The KA-550DSP's Bluetooth compatibility allows for wireless connection to any A2DP stereo Bluetooth device. That means you can play audio files from your phone, laptop or any other Bluetooth enabled device within a 30 foot foot range. The KA-550DSP gives you the freedom to stream music wirelessly from any Bluetooth enabled device. There are also a wide set of controls to help show off your mixing and production skills, such as the Bass, Mid and Treble. These inputs also display Track Title, Number and Elapsed Time to help you stay organized as you navigate through tracks. Newest Model: 2019 SINGTRONIC KS-912V, the best known name in professional karaoke around the world with unprecedented sound quality and 1000 Wattages power. The exceptional quality and smoothness of sound over the entire audible range ensure unprecedented excitement. Once you have sung with these speakers, you will never be satisfied with anything less. The clubs, bars and home that use these speakers will enjoy an excellent reputation among their customers. We have every confidence in the outstanding sound quality of these speakers. Newest Model: 2019 SINGTRONIC UHF-550M Professional Wireless Microphone System is the right solution for Karaoke vocalists, Experience the ultimate freedom and versatility with the SINGTRONIC UHF-550MKII Professional Dual Channel Module Wireless Microphone System. The Dual channel UHF wireless microphone system with each microphone on its own independent UHF channel will gives you maximum utilization without the fear of frequency interference. Going wireless means that you are free from cables for up to 500 feet of range from the receiver unit. Plus, a super energy battery saver Handheld Microphone will last singing throughout the entire night. 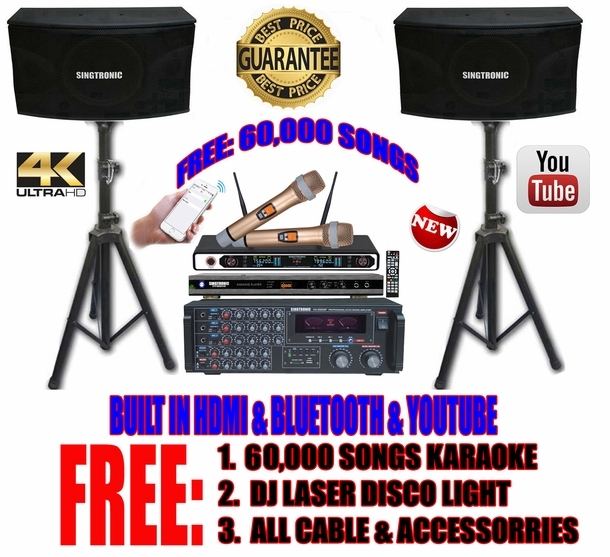 Newest Model: 2019 SINGTRONIC KTV-9000HUD Karaoke-On-Demand (KOD) is the latest and most advanced HDMI (4K) UltraHD & Full HD 1080P Hard Drive karaoke player in the world comes with 2TB to 16TB hard drive which can hold approximately over 100,000 songs karaoke vocalist tracks. There are many new features that differentiate KTV-9000UHD from the rest of the players in the market. It’s capability of recording any DVD/VCD/CDG& MP3G discs onto the hard drive through USB Ports makes it so much easier for users to add their favorite music into the collection. KTV-9000UHD comes with a USB device that allows you to ripping all CDG disc. into MP3G song files and able to playback any supported MP3, MPEG, AVI, MKV, DivX, VOB & JPEG files anytime. The unit also has a HDMI output which provides (4K) UltraHD and Full HD 1080P High Definition Multimedia Interface videos for its consumers. Its so easy to use both on-screen navigation with "Song Search" & Singing Display Lyrics screen display on your TV , excellent audio and full 1080P video quality.